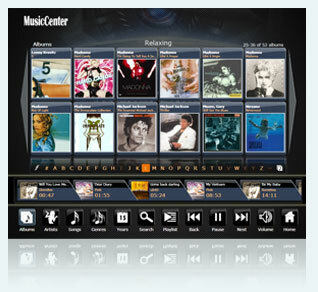 ZenPoint MusicCenter provides a complete and comprehensive overview of your music. It's easy to find the music you're in the mood to hear. Create your own playlists with your favourite music as easy as ABC. 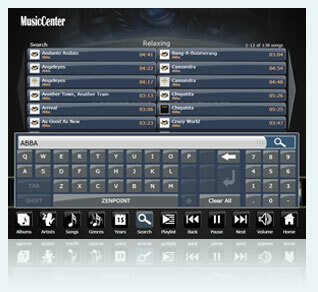 The MusicCenter is also great for parties, with one click, you can set your MusicCenter into Party Mode, and it will act like a Jukebox. It has never been easier to find a specific song. It's possible to create your own playlists and switch between them at runtime, or make your own themes. You can add as many playlists and themes as you like, and it's also possible to setup action rules for every playlist. If the current playlist is empty, a random song from your music collection will be played. You can find a specific song by searching through your music collection with a free text search. You can search for an artist, album or a song title. The free text search supports auto completion.